macOS High Sierra has recently gone public. It’s natural for it to have unforeseen bugs and rough edges. And right now you yourself are helping Apple to solve them by seeking fixes to common macOS High Sierra issues. We’ve pieced together the most reported ones so far (as of December 2017), from macOS High Sierra not downloading to Wi-Fi issues and a few others. macOS High Sierra issues: what can go wrong? As soon as you started downloading macOS 10.13 the download would end abruptly and you will get messages like the one above. You may be shown “Installation of macOS could not continue” message on your screen. Aside from poor internet connection, it’s possible that too many users are downloading the macOS at the same time. Try rebooting the Mac App Store or repeat the download in a few minutes. Can you improve your internet connection? Hop on a better Wi-Fi network or connect via cable. 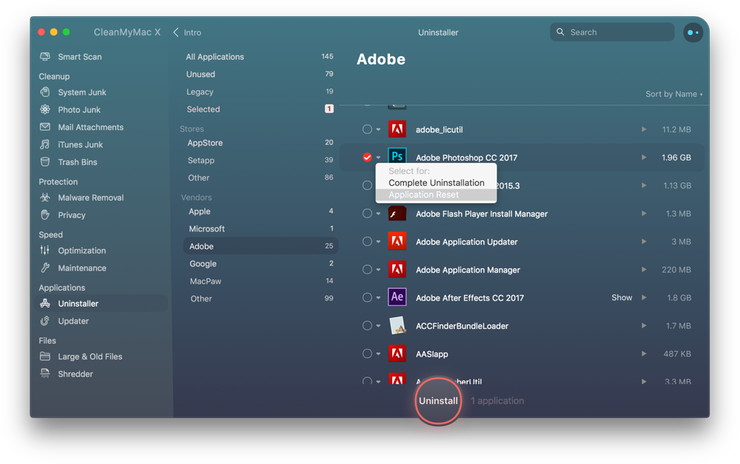 Before you resume the installation, remove all partially downloaded files (that are named macOS 10.13 High Sierra) from your Mac. Try again. You downloaded macOS High Sierra and clicked the installation file, but for some reason, nothing happens. You clicked Continue, but the now button appears to be greyed out. Control + click the installation icon —> Choose Quit. Go to Applications to find macOS High Sierra Installation file. Repeat the installation. Be patient, it does take some to begin. You downloaded macOS High Sierra and clicked the installation file, but for some reason, nothing happens. You clicked Continue, but now the button appears to be grayed out. macOS High Sierra takes about 8 GB on a drive. Though it doesn’t seem terribly much, it is still recommended to have at least 15-20 GB of storage for macOS High Sierra to run smoothly. But first of all, figure out what's taking up your valuable space. 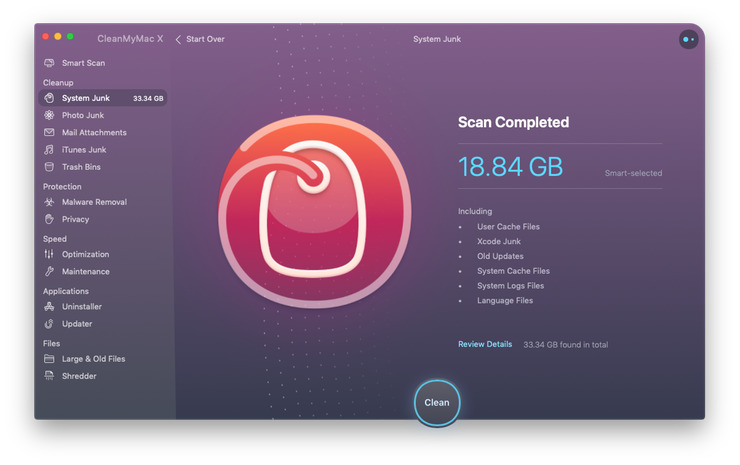 To get some storage space back, my favorite is CleanMyMac app. It has a feature that specifically searches for large and unused files on your drive. Deleting system junk alone would save you around 2 GB. You can always prefer to do the job manually, but it could be too much of a hassle. Anyway, it’s a safe practice to install the new macOS on a clean Mac. So download CleanMyMac for free and clean up your drive. 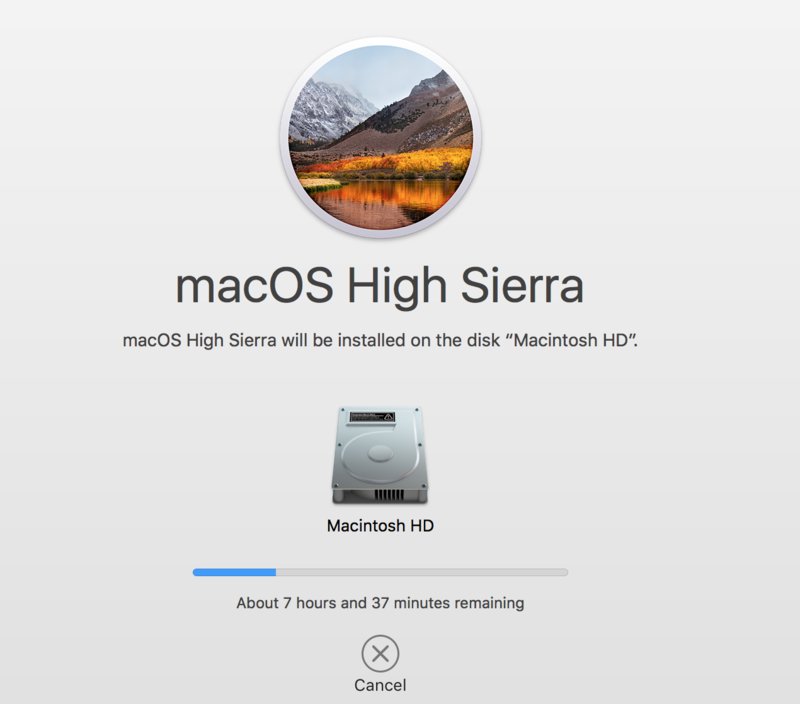 By then your Mac should be ready to install and download macOS High Sierra. This issue has been reported since El Capitan and unfortunately is still the case in macOS High Sierra. The Time Machine hangs while showing “Preparing backup message” and may stay unresponsive for hours. Go to Time Machine settings menu and click the red [X] to end the backup process. Well done. Now you have removed the unsuccessful backup file. 3. 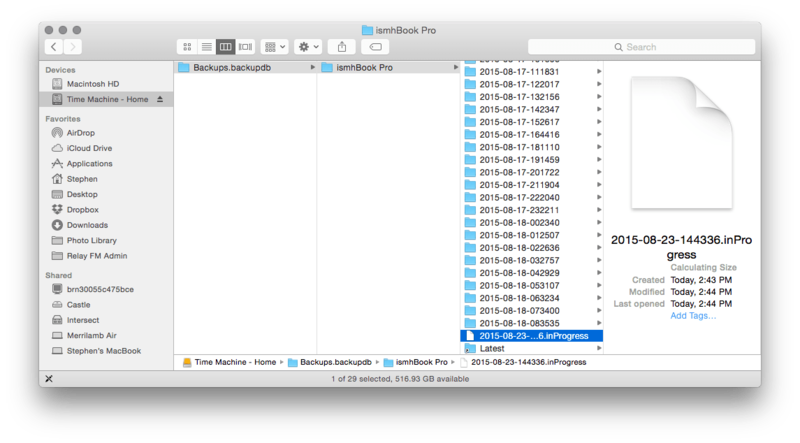 Restart your Mac and repeat the backup using Time Machine. Try giving the system some time to configure itself. If it doesn’t help, reboot your Mac. Some users reported their Mac was running slower after macOS High Sierra update. Check out this guide on how to speed up your Mac and try these tips on your machine. First, figure out what’s causing the slowdown. Go to Applications —> Activity Monitor and see what apps are weighing on your Mac’s memory. Force quit the apps that are excessively eating up CPU resources. Go into each of the folders and clean out the files inside. Note: Do not delete the files themselves, just their insides. Please note that this method isn’t safe as you may accidentally delete the wrong folder. To safely clean out your system caches, there is an easy workaround. It is secure and takes no more than a minute. Download CleanMyMac X (it’s free to download) and click System Junk. This way you’ll remove all system junk without a risk to your Mac. So you have successfully installed macOS High Sierra, but for some reason, your Mac won’t boot up. You may try to reset NVRAM in this case. NVRAM stands for non-volatile RAM and stores various system settings like time-zone, startup disk selection, kernel panic preferences or display resolution. Resetting NVRAM helps to perform a fresh boot from scratch. Now your NVRAM has been reset. Additionally, you can launch Disk Utility to fix boot up problems with macOS High Sierra. 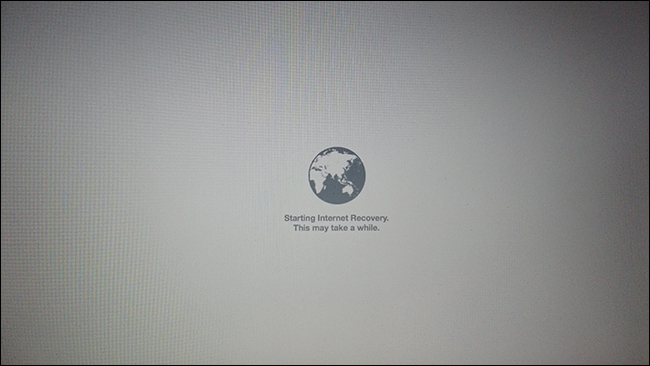 Internet Recovery starts your Mac from Apple’s external servers. This is a helpful utility to use in case your boot sector is damaged or there are some hardware issues with macOS High Sierra. The utility will perform memory tests and configure your Mac for successful bootup. Then your system will download a recovery image from the Internet. To proceed from then, just follow the prompts on the screen. 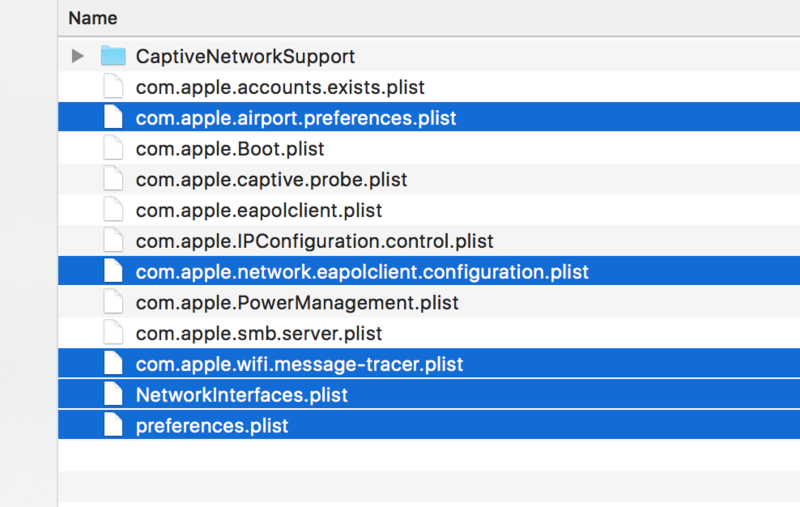 Some people reported their Wi-Fi dropping off after installation of macOS High Sierra. You may also notice your connection got slower. To tackle this, update your Wi-Fi preferences. First, you will need to remove the current settings which is quite easy to do. 4. Within that directory, you need to select the files with .plist file extension. These are your current preferences (probably bugged or corrupted). 5. Move the selected files to the Trash. 6. Restart your Mac and router for changes to take place. Don’t worry, the new preferences will be created automatically to replace the old ones. This is a common issue as Apple has moved to the 64-bit architecture with the release of macOS High Sierra. The implication is that a whole scope of 32-bit applications will not be supported on the new macOS update. Not all developers have yet converted their apps to 64-bit, but it's a question of time, really. 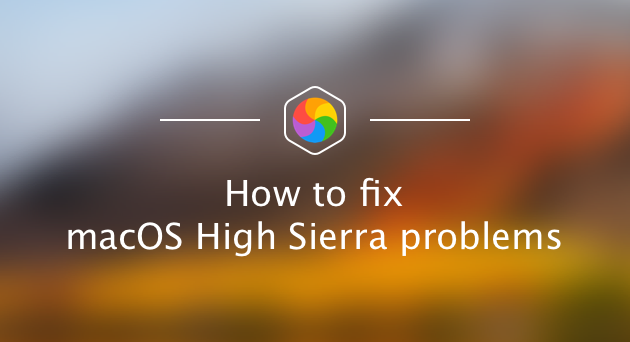 If the app repeatedly crashes on macOS High Sierra, update it to the latest version.You may visit developer’s website and read about High Sierra compatibility. Another option is to reset the app. In 90% of cases, this method will prevent an app from crashing again. From my experience, I found that an automatic solution works better. I personally use CleanMyMac to uninstall and reset the problematic apps and it works magic. Download CleanMyMac X (free download). Choose an application from the list. Launch the app and see if it helped. Has your battery life reduced after upgrade to macOS High Sierra? This issue has also been reported since June 2017 High Sierra Beta release. To look deeper into the issue, go to Activity Monitor to check what processes are most energy-demanding. Just go to Applications -> Utilities -> Activity Monitor. Click Energy tab for details. If a particular app is a burden on your battery, reinstall or reset it (as described in the chapter above). Additionally, consider replacing the app with a lighter alternative. Advertised as the "most secure Apple’s macOS", High Sierra looks a total opposite, just months after its release. Three 3 major password scandals have already broken out and how many bugs are there to come? In September 2017 a technology expert, Patrick Wardle has proved that it is possible to retrieve the Keychain’s passwords without first providing your master password. This vulnerability can be accessed by an unsigned app and concerns not only High Sierra but previous macOS releases as well. Then, a major root password bug, allowing full access to your Mac without any password at all. 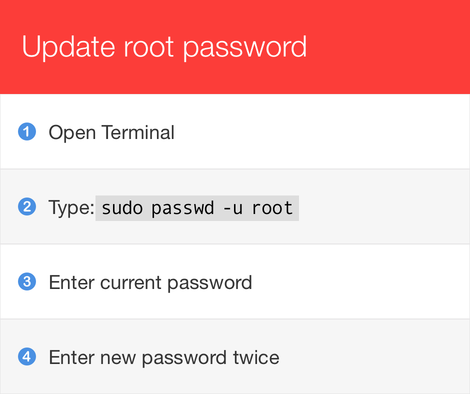 If you haven't set your root password (it's like a ground-level admin password), it's time to do it now. The quickest is to do it via Terminal. Apparently, this is not the only password issue with High Sierra. There has been detected a problem where macOS High Sierra would show you your original password instead of a password hint. To solve it, Apple recommends installing a Supplemental Update to macOS High Sierra. Meanwhile, you can protect your important data with a trusted encryption solution. Hider 2 app is a nice one and is quite flexible for most users' needs. Mail app in macOS High Sierra has proved vulnerable to errors as well. A few folks have reported that email notification stopped working right after the update. In other words, email banners were missing. Good news, it can be quickly fixed via System Preferences. This should reactivate the Mail notification service. What else may go wrong? 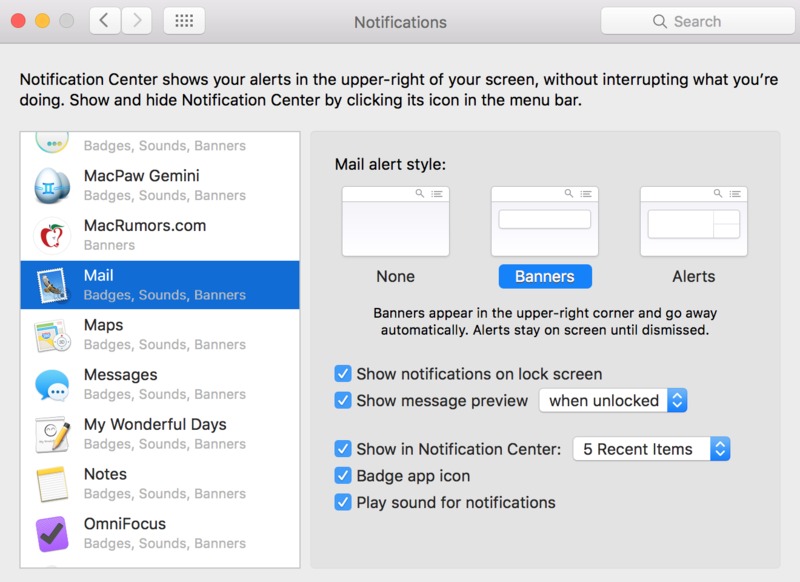 You may notice your Mail app now works slower after you’ve upgraded to macOS High Sierra. The explanation is that it’s probably overloaded with messages and still carries the leftovers from the previous macOS. As a result, it takes forever to search for the things you need. Some apps offer an easy fix for this and will reindex (or reorganize) the Mail database on the new macOS for you. 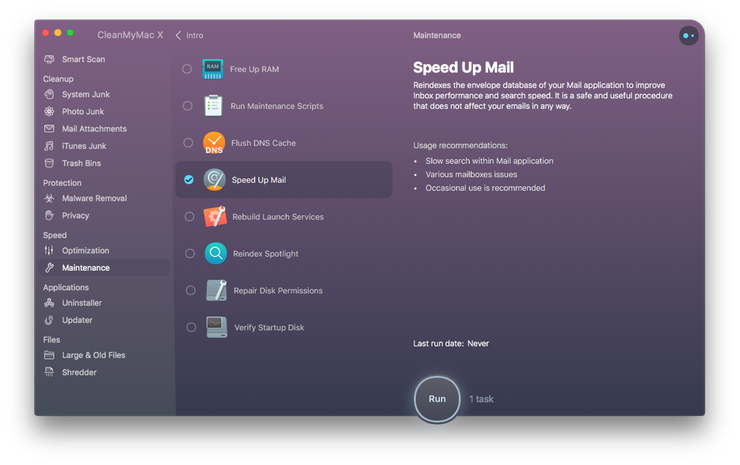 For instance, the latest version of CleanMyMac app has a special tool that speeds up your Mail. You can download the app (it’s free to download) and open the Maintenance module. When within the Maintenance module, launch Mail Speed up tool. That’s it, your Mail should now get speedier. See the screenshot above. Despite the aforementioned problems macOS High Sierra still packs an impressive punch of simplicity and power. Get to know it more, explore the newly added features as each one has a tremendous amount of clever engineering behind it. Meanwhile, thanks for reading this article. Stay tuned for more.